Baker's Branch is an Eden forty-five miles from my front door. Yesterday I got up early and harvested the first greens from my garden. I was making sandwiches for my father-in-law and myself. We had a special day ahead. 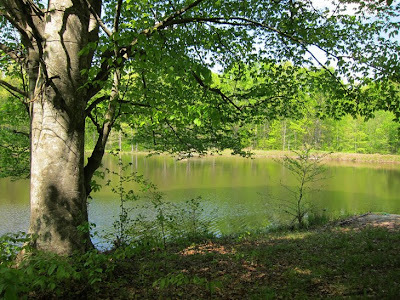 He owns a share of a large and mostly undeveloped piece of land about 45 minutes from town that is divided up like a pie with a pond in the center. The only permanent structure visible from the pond sits on a communally shared tranche. It is a small but beautifully crafted cabin consisting of a porch and a dry sauna. The routine is always the same: first we heat up and stretch in the wood-stove-heated sauna, then dip in the chilly (though no longer frigid) pond. Afterward we sit on the porch and enjoy the woods, then repeat the cycle four or five times. The pond occupies a space in my life akin to the Turkish Baths back in New York. We go there to rest and rejuvenate. We sweat out—and I stretch out—the toxins that slowly accumulate in daily life. The pond’s water and its many subtleties inevitably recall Thoroeau. The open spaces, soft treescapes, and primeval purity couldn’t be more different than the delightful skank of the Turkish Bath grotto. During one of his visits to New York, I took the old man to the Baths and he fully appreciated its many—and consummately urban—charms. Breathing the fresh air and hearing the natural sounds, we reflected on that other place and how we love both places equally well, but in different ways.